Betfinal Casino will then reward you with a bonus (Welcome Bonus is for new players only). The terms and conditions of the bonuses vary between different casinos and might also change over time and between different countries, so it is important to compare the different offers and read the T&C for Betfinal Casino before signing up. Boasting its passion for sports, Betfinal, owned by Final Enterprises N.V, proudly shows off its awesome casino and live department. Blowing its yellow referee whistle, Betfinal invites all gamblers and punters, male and female alike, to climb onboard and join the game! This reputable online gambling firm holds the stamp of trust issued by the Curacao EGaming and is fully certified by Comodo. It furthermore has the SSL encryption protocols in place and safeguards all your private data and gameplay, so no third party can disrupt data transactions. Respecting its clients, their privacy and ensuring their protection, Betfinal Casino does not allow any player under the legal age of 18 to gamble at their quarters and is a firm advocate on responsible gambling. The well-rounded portfolio of games available at Betfinal Casino department are powered by iGaming behemoths only, and are counted in hundreds. A superfluity of games and their subcategories will please even the pickiest of players, so let’ get going. Some of the names backing Betfinal Casino up are Microgaming, NetEnt, Evolution Gaming, IGT, Play’n GO, Yggdrasil Gaming and NextGen Gaming. What else is left to say other than – let’s get ready to rumble! All slots (hundreds of them!) are categorised based on their themes. 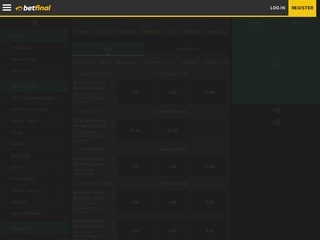 By doing this, Betfinal Casino has made it extremely easy for you to find the game you are after. some of the self-explanatorily named departments are called Into the Sea, Mythological, Wild West, Sports Games, Welcome to the Jungle, Mysterious East and Once Upon a Time. You can also sort the games based on their popularity and software providers. 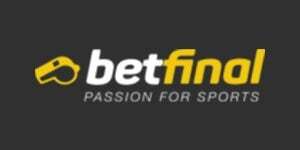 Betfinal’s favourites for the season are Gonzo’s Quest, Immortal Romance, Break Away, Guns ‘N’ Roses, Moon Princess and Blood Suckers. Jackpots have nestled and are counted in dozens, coming from diverse suppliers and varying in the most colourful themes as well. Crack your knuckles and get all set for the table games at Betfinal Casino! The online gambling destination hosts a plethora of card and table games such as Roulette, Blackjack, Baccarat and Poker, all of which are available in multiple forms. Enjoy the metamorphosis by playing English, European or American Roulette, European Blackjack, Mini Baccarat, Roulette Silver and many more. That is not where Betfinal Casino’s offer stops. Video pokers have also found home at the eminent online gaming establishment, in the shape of Jacks or Better, Deuces Wild, Joker Wild and All American. Rummage around and you will find them all in single- and multi-hand modes. For those who prefer betting with live dealers the casino Betfinal Casino offers a spectacular live dealer lounge. A large range of live games are available around the clock, with real croupiers dealing them for you when you feel like it. The betting expert operates a litany of live games including Live Roulette, Live Blackjack, Live Lightning Roulette, Live Football Studio, Live Dream Catcher and Live Baccarat, which are currently the favourites at the casino. You will find dozens of other live games such as Sic Bo, Tambola and Casino Hold’em scrolling down the endless realm of Betfinal’s games. Money transfers at Betfinal are time-saving and efficient. The firm deals with all banking matters in a few hours, with the general pending time never exceeding 48 hours. Final Affiliates, the online casino’s affiliate program, accepts a mass of banking methods such as bank wire transfers, fast bank transfers, ewallets and credit and debit cards. Electronic wallet options at hand include EcoPayz, E-Pro, Neteller, Skrill, Paysafe Card, and German Giropay. All cards powered by Visa and MasterCard are also available for use. The tender accepts a whole bunch of international currencies such as Azerbaijani manats, Georgian laris, Kazakhstani tenges, Russian rubles, and Turkish lira, in addition to the most widely used ones. With immense brands such as Betfinal, emails are typically the most popular among players. The venue already has an established and thoroughly compiled FAQ list with answers, so clients usually find what they need there. When they do not, they send them an email to [email protected] and get a reply within 24 hours. The services of the help-desk are available in Arabic, Russian and Turkish as well. Due to the vast number of clients and therefore thousands of enquiries, Betfinal Casino’s customer support team is not always able to provide instant help. The Live Chat facility is open every day of the week between 14:00 and 18:00 CET. Simply click on the green ‘Chat’ bulletin on the right hand side of your screen and the service will open for you. Your German is better than your English? Not a problem – the team is fluent in German, English, Swedish and Norwegian, and within the working hours you can chat with a team rep in all of those languages.